After finding out we were having a boy, we had to start turning a room into a nursery. The obvious choice was our guestroom. I spent countless hours going through Pinterest boards and googling pictures of DIY nursery ideas, deciding how I wanted to decorate our little one’s room. The room was currently yellow – a color I had chosen years before. The yellow was bright and sunshiney, but it was ready for a change. The furniture was ready for a change as well. It was odds and ends from flea markets and leftovers from our college days. 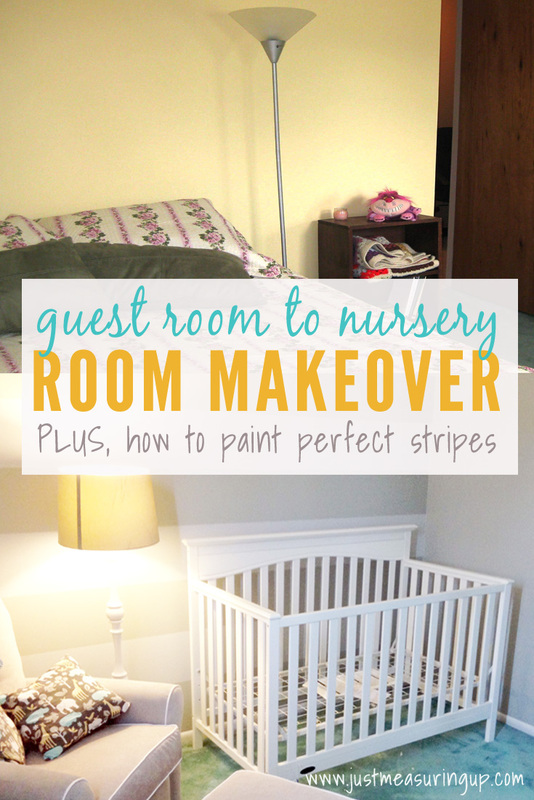 It was certainly time to makeover the guestroom, converting it to a beautiful baby nursery. The carpet was already turquoise, so the plan needed to revolve around that. I love a pretty carpet, but when they are bold colors, you have to go neutral with the walls. After much consideration, I decided to paint the walls gray. I know that sounds crazy – who paints their nursery gray?! But, I had a vision. 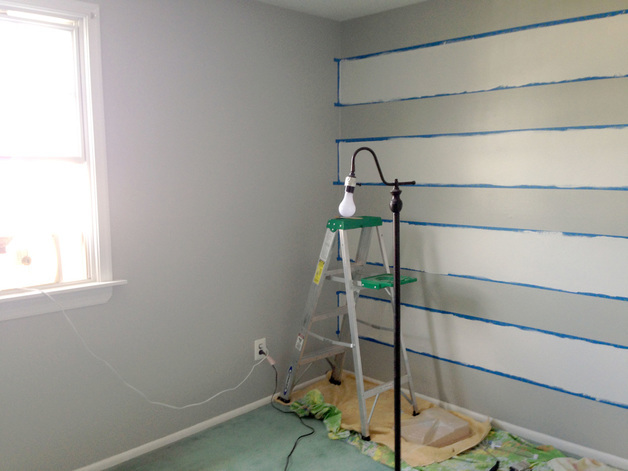 My DIY nursery ideas included painting the fourth wall, the longest one, striped with a lighter/whitish gray. This wall was opposite the mirrored closet doors, so the reflection of the stripes in the doors would make the small room appear larger. The furniture would be all white, and I would work in more turquoise in other areas – pillows, blankets, and baskets. Two of my sisters offered to paint the room since I was pregnant. And, it gave me time to work on more DIY nursery ideas. PK, my fact-loving, detail-oriented sister had never painted a room before – let alone done any house project other than some light dusting. Bridget, on the other hand, designs movie sets for a living and can pretty much do everything. She is a hard-worker, a great delegator, and very goal-oriented. 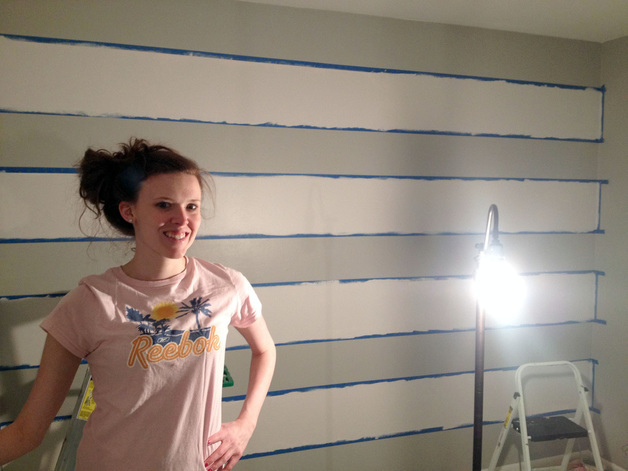 Accordingly, she gave PK the responsibility of planning out the stripes, putting PK’s meticulous nature to good use, while she got started on the rest of the room. We planned to do nine, thick alternating stripes, aiming for the stripes to start and end in the base color – the darker gray. PK started with the laser level and masking tape with the plan to do two rounds of masking tape, painting the darker stripes first. 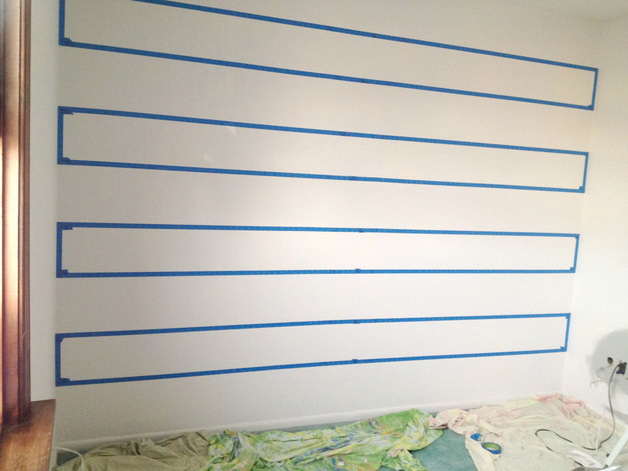 After that dried, she did another round of masking tape for the lighter stripes. It was more time-consuming this way, but paint wasn’t wasted. 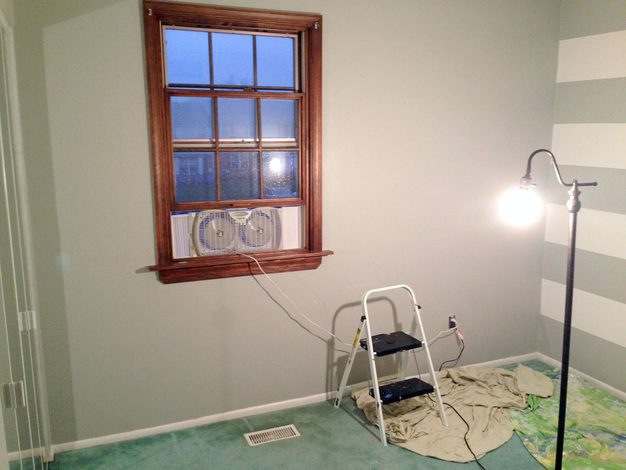 After the room was painted with the base color, the wooden window trim stood out like a sore thumb. It screamed to be painted white. This is a prime example of how one project can turn into another; however, the end result made it worth all the effort they put in! Below the window trim is now painted white, the second round of masking tape is on the striped wall, and the lighter stripes are now painted. After looking through so many DIY nursery ideas, the room was coming together nicely. I forgot to mention one thing about my sisters – they love Frozen…. and they were painting the nursery right around the time when the soundtrack came out. Yes, they are in their 20s, but they love that movie – the funny sidekicks, the catchy songs, and of course the fact that it’s about sisters. I, on the other hand, was actually disappointed I couldn’t help. However, I did enjoy the extra time to catch up on the Real Housewives with my buddy Zeus. Here’s PK and her awesome stripes. Not bad for her first time painting! Other than cleanup, the room was done. The accent wall looked perfect! Looks like all that singing, I mean painting, paid off. We loved the grays of the nursery. If you are looking at turning a room into a nursery, definitely consider neutral colors. They are easy to work with and can be easily accentuated. 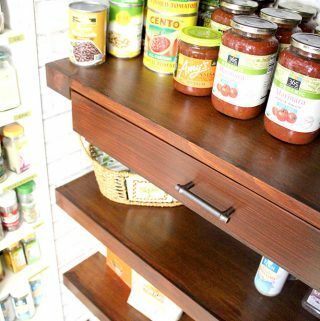 For every piece of furniture, we carefully read reviews – especially for the changing table and the crib. The crib and glider chair were from Babies R Us. We used coupons that came in the mail. The changing table was from Wayfair, and the lamp was a Target find. I made the pillows with leftover fabric from the curtains. I also made the storage bins for under the changing table. The storage bins were made from contact paper and cardboard boxes. 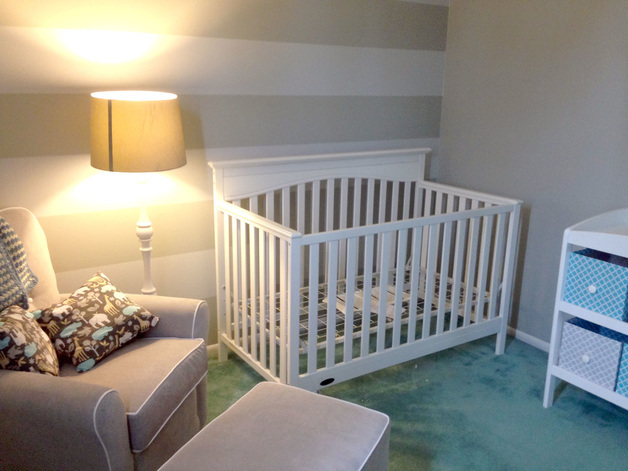 If you are looking for DIY nursery ideas, the gray striped accent wall looked gorgeous – and it was an easy DIY. That is really cute! I love the stripes! 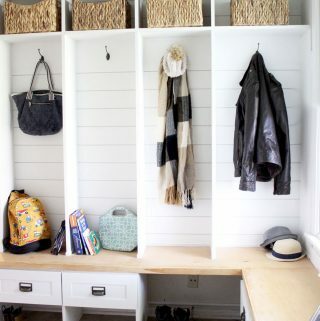 Great redo of a room! 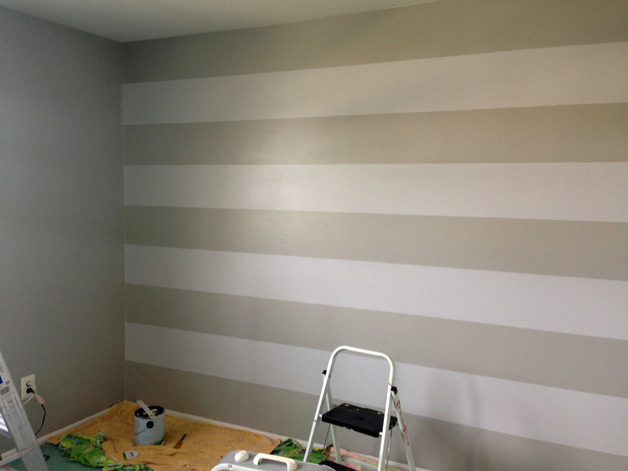 We also have stripes in our nursery, ironically! Looks very ready for Baby. Visiting from Coffee and Conversation party. So cute. Perfect for any baby. And the grey looked good with the rug and rest of the room. Those stripes looked wonderful. Looks great! I wanted to paint our nursery grey when I was pregnant with our first, but the husband would have nothing to do with it. It took two more pregnancies for me to finally get my way. 😀 Thanks so much for sharing at the #happynowlinkup! Hahaaa Ash thought I was nuts when I said gray too! But it’s such a good color:) have a great week! Thanks Elise! Yes so helpful! What an adorable transformation – love the stripes! Your tip about using the laser level was genius! The less fussing with pencil marks the better. This tutorial is definitely going into my arsenal of paint project DIYs. Thank you! Such a beautiful new nursery. I think your tutorial is excellent, but I am daunted by stripes. Congratulations on a boy. That must have been a fun project with great results. Wonderful that your sisters helped out and felt a part of the fun. Love the stripes . Such a cute nursery. Thanks for sharing this at the Inspiration Spotlight party.